Today’s hike was going to be quite an adventure. Based on the weather reports, we were planning on getting rather wet, however things turned out quite different than we expected. 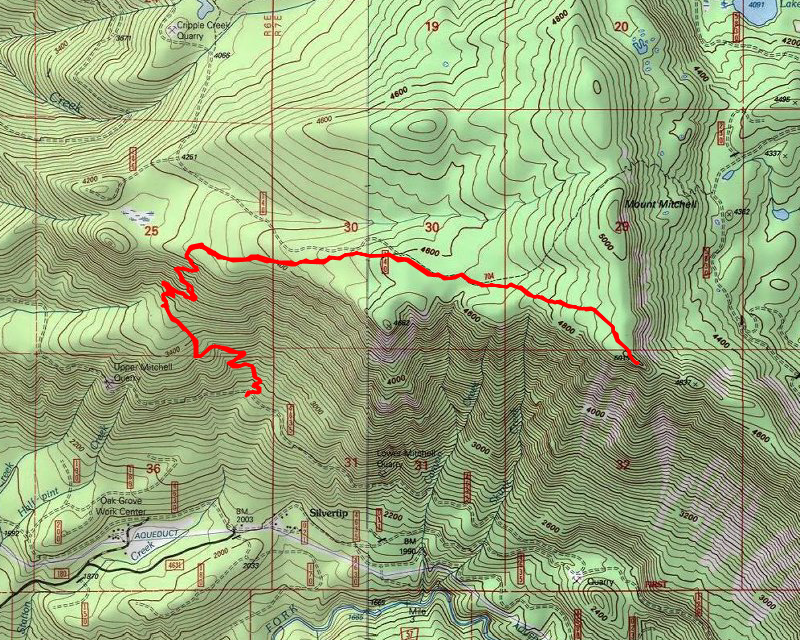 The plan was to hike the MP3 trail to the Rimrock trail and then head east on the Rimrock trail to the overlook. We brought our snowshoes, and at some point, we figured we would need them. It rained a bit on the way to the trailhead, but by the time we got there, the rain had stopped. 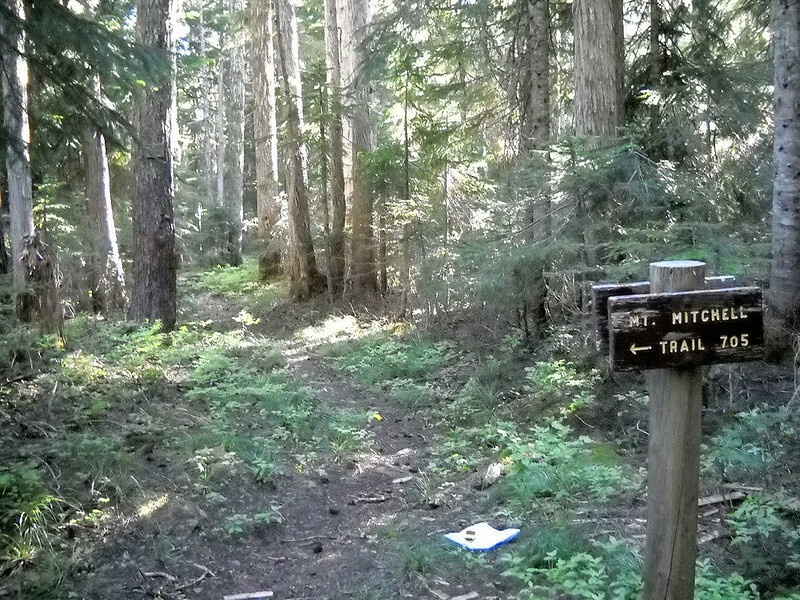 Interestingly enough, back in January, I hiked this trail. It was oddly warm in January, and there was very little snow anywhere. The bad news was that the beginning of the trail was rather difficult to get to due to a tree that came down recently. Today, the good news was that someone had cleaned that all up, and the ramp leading up to the trail from the road was all clear! While eating lunch, Thor played around in the snow, and Kirk and I talked about what our next objective was – we figured it was around 2 miles to the overlook, and decided we should have enough time (and hopefully energy) to do it. We headed out, down the trail heading east. The snow quickly began to get deeper. It wasn’t too hard at first without snowshoes, but soon it was easier to put them on – it is still harder to snowshoe than to hike, but it is easier than postholing. For the most part, we followed the trail, but I think there were short sections where we missed it. The trail is very well blazed and that helped us to know we were on the actual trail. While were out on the point, we could see dark clouds all around us. The weather forecast said there was supposed to be thunder storms about 2pm, which was right about the time we were there. We saw some dark clouds moving towards us, so we decided we should get back in the trees before it started raining. Just as we were getting ready to leave, the rain came in – in the form of snow! It wasn’t heavy, but it was definitely snowing. We decided it was a good time to head back down the hill. Once we were back in the trees we didn’t feel or see any of the rain/snow. We continued down and soon came to the junction with the MP3 trail where we had lunch. We took off our snowshoes at this point and then continued down the trail. We made really good time on the way down – it is a lot easier going down than up! I’ve seen it many times, but for some reason today it really moved me. What a beautiful scene. We made it back to the truck about 5pm, all very tired from the days adventure. Just about the time we got there, it started raining. We were most fortunate with the day’s weather. On the way down the 4635 road we spotted three deer that ran across the road! We decided to stop at Fearless for a burger and a beer – a wonderful way to end a great day of adventuring in the woods!